We have a retail storefront in Chilliwack that you can visit. Our shop has a collection of keys, locks, safes, knives and other gifts for your choosing. We also offer custom engraving services to personalize your items. Feel free to drop by our shop with your jewelry, watch or any other personal belonging to have them engraved by our experts. We are experts in residential, commercial and automotive locks and are happy to come to your location to provide mobile unlocking, installation and repair services. Emergency locksmith and after-hour services are also available if for your urgent needs. Doug's Key Mart has over 30 years of locksmith experience and is fully licensed, insured and bonded so you can have a peace of mind. 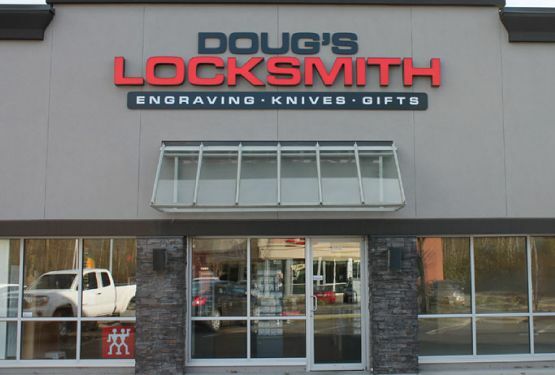 Doug's Key Mart & Locksmith Service has been serving the Fraser Valley community since 1981. Although our storefront is located in Chilliwack, we have clients coming from Abbotsford, Mission, Harrison Hot Springs, Agassiz and Hope.